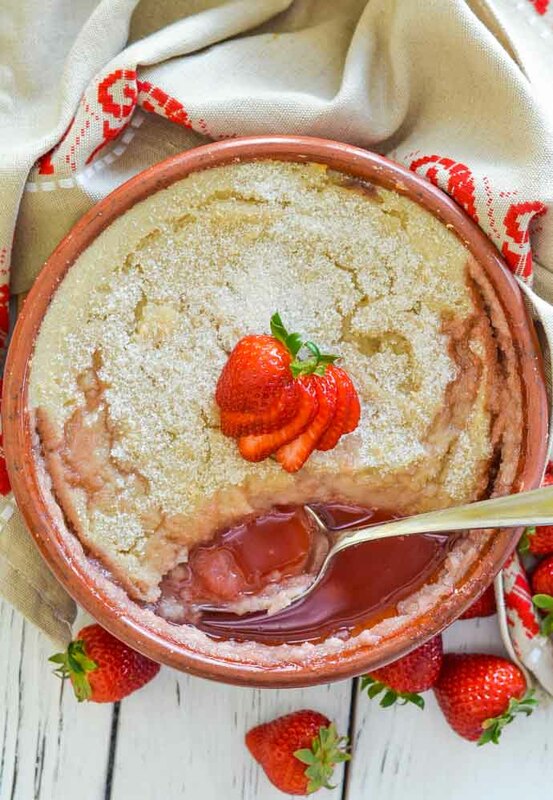 Semolina pudding but not as you know it……Sweet strawberries are baked under sugar encrusted semolina until bubbling & saucy. The pudding becomes almost sponge-like & is so comforting & delicious! “School dinners. school dinners. Concrete chips concrete chips. Soggy semolina. Soggy Semolina. I feel sick. Bathroom quick. It’s too late, it’s on my plate.” ???? I’m not doing much to sell this recipe am I? ???? When I told my husband I had bought a bag of semolina he wasn’t impressed and said that he hoped I didn’t expect him to eat it. He obviously had those old school day memories too. He soon changed his tune when this got taken out of the oven for the first time! It is truly irresistible. 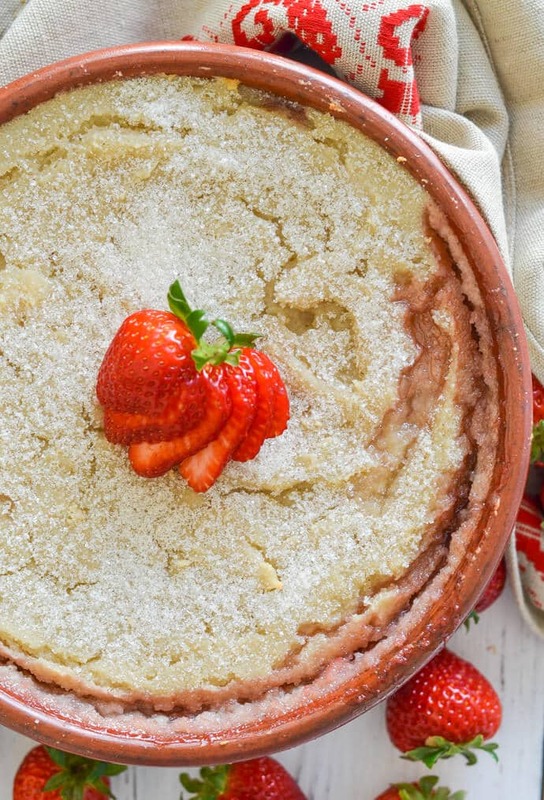 The strawberries bake up to a soft and saucy perfection and the thick, baked semolina pudding becomes almost sponge-like. It’s hard to describe but you will see what I mean when you try it. It all gets baked in the oven but I like to finish it off under the grill. I still don’t know the term for that here. I know it’s known as broiling. So do I finish it off under the broiler? Is that right? I’m feeling very foreign again…..???? It’s the baking it in the oven that transforms this Semolina Pudding into something NOT like school dinner semolina pudding at all. It couldn’t be more different and is a million, trillion times better. We cant stop making and eating it! The fact it’s so easy too makes it even more appealing. This is the perfect recipe to make when you have some strawberries that are a little past their best. A bit like my Strawberry Baked Oatmeal. I can’t wait for you to try it! Let me know what you think by rating it when you leave a comment below. Be a ☆ and share a pic on Instagram too. I would love to see! Semolina pudding but not as you know it! Sweet strawberries are baked under sugar encrusted, almost sponge-like semolina until bubbling, saucy & delicious! 180g | 1 cup semolina , the slightly coarser type is best but semolina flour or fine ground will work too. Slice the strawberries and put in the bottom of a shallowish oven proof dish. Pour over the maple syrup and stir to coat. In a small pan add the semolina, sugar, salt, vanilla and milk. Stir with a balloon whisk to work out any lumpy bits. If you don't have a balloon whisk a wooden spoon will do. Warm over a medium heat, whisking constantly. If you stop it will go lumpy. Keep whisking until it's too thick to carry on. (Like the texture in my video above). Spoon the semolina pudding on top of the strawberries. If you don't do this immediately it will become really, really thick and a bit difficult. Don't worry if you do get interrupted though as once it bakes up it will be fine. Smooth it out, trying your best to seal it all the way around the edges, then sprinkle over a generous amount of granulated sugar. At this stage you could leave it to cool and refrigerate, ready to bake later. Place in the hot oven and bake for 30 minutes. Broiling is optional but it makes the top crusty and delicious so I recommend doing it. Broil it as soon as it has finished baking and until it is bubbling and crusty. Be careful it doesn't burn. It is normal for some of the liquid to erupt through. Leftovers reheat well in a microwave or covered in the oven. It has become clear since publishing this recipe, that semolina is pretty hard to find in the U.S. It is not the same as cream of wheat or Farina. Semolina is yellower and looks a bit like cornmeal. It is made from durum wheat like pasta. Farina or cream of wheat, from my research is different. It comes from a different type of wheat and is whiter and has a lower protein level and doesn't hold it's shape like semolina would. I think farina would technically work but the texture wont be the same. I'm not sure about flavour as I've never tried it. You can buy Semolina from Amazon for a reasonable price. I link to one in the recipe above. I would imagine too that any Italian grocery store would sell it. Bob's Red Mill semolina flour would also work well. It is a brand that is very widely distributed across the U.S and Canada. Very interested! I am unfamiliar with the term “Semolina Pudding”, but am wondering if the term “semolina” is the same or similar to what we call here in the States “wheat farina”….? Thus I’m planning to give this a go, using wheat farina (plus the addition of some nice, home-grown rhubarb along with the strawberries :-D)….. It appears that semolina is pretty hard to find in the U.S which is really strange as it is easy to get here on the West Coast of Canada. It is yellow and looks very like cornmeal. It is made from durum wheat like pasta is. Farina or cream of wheat, from my research is different. It comes from a different type of wheat and is whiter and has a lower protein level and doesn’t hold it’s shape like semolina would. I think the farina will work but the texture wont be the same. I’m not sure about flavour as I’ve never tried it. You can buy Semolina from Amazon for a reasonable price. I link to one in the recipe. I would imagine too that any Italian grocery store would sell it.It seems too that Bob’s Red Mill sells a semolina flour. It’s probably a bit finer than the one I used but is actually semolina so would probably be better to use than cream of wheat or farina. I hope that helps! Oh and rhubarb in it is really good. We had it made with rhubarb instead of strawberries last night! Enjoy! 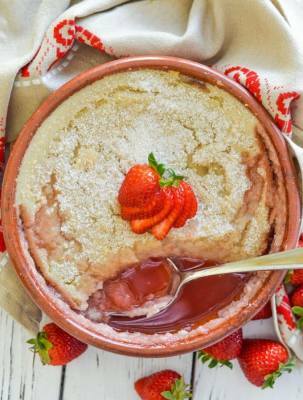 I’ve never had semolina pudding before, but I’d love to try your strawberry version! I believe you this is delicious and nothing like your school lunches :) It looks incredible. Thanks for the inspiration! You’re welcome. Thank you Sarah! I don’t think Semonlina Pudding is well known in Canada or US… but from the look of this recipe, it should be! I am just imagining those flavors together and the texture, it’s brilliant! Thank you! I was just having a discussion with a reader about it. She is from Poland and semolina is very popular there like in England. She said it’s a post war thing. Apparently because it was so cheap and filling it became a really popular thing to eat when food was scarce and has stuck around ever since. It kind of makes sense and explains why it’s not so popular here. I’ve never had semolina pudding, and as awful as your school days puddings sound, this looks incredibly delicious. Sold! For me the perfect recipe. Strawberries sooo delicious and than with the pudding.. Yummy in my tummy. Thank you Jasmin. It sound lovely with cinnamon and sugar. Perfect comfort food! You say serve immediately, so if you have leftovers will it still be edible the next day? You can reheat it. I mention that in the recipe notes. It’s not good cold but is almost as good as new once you warm it up again! I just made this and it is HEAVENLY! Thanks for the recipe. I am so pleased you enjoyed it Kris. Thank you so much for letting me know!